At Citizens Advice Wandsworth we appreciate Mushkil Aasaan as a local partner, and value the specialist services that they provide to the Asian community in Wandsworth. We recognise that commissioning processes can be challenging, and that for some groups the processes involved may be a barrier to successful engagement. We hope that flexibility and support can be provided to our local community groups to enable them to participate equally in these competitive processes to help ensure the diverse needs of Wandsworth citizens are met. I worked as a local GP and was able to refer several patients for social care. There is no other resources available to an extremely vulnerable demographic. Would be a huge loss. This is a great organisation who we work with. They have really helped shift care away from hospitals and can provide culturally appropriate therapy in a way we can’t. I was shocked to hear that Mushkil Assaan is not in the running to be re-appointed as a provider of culturally-sensitive, local home care services. It beggars belief that the Council is not considering them as an ongoing provider. I hope that this decision can be re-thought as soon as possible. Mushkil Aasaan is a real asset to the local community and provides much needed care and support to families in need. For 25 years, it has provided culturally sensitive and compassionate care right across Wandsworth through its commitment to diversity, employment of over 100 people and as a hub for some of the most vulnerable people in the local area. The services Mushkil Aasaan provide and the wide range of community groups that use the facilities are testament to the hard work of Naseem and her team over the years. It is vital that Mushkil Aasaan are allowed to continue to provide this essential service. 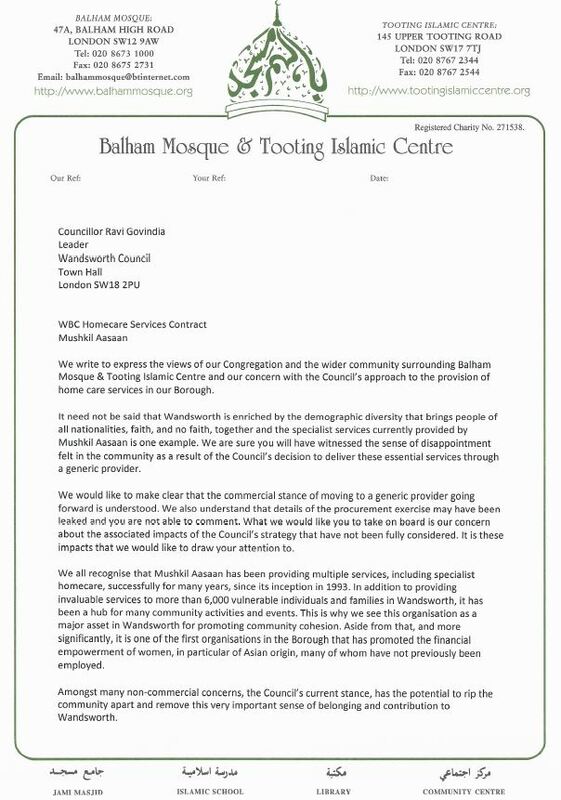 I’m writing to express the Balham and Tooting Community Association’s concern at the potential loss of homecare services meeting Asian cultural needs, which Mushkil Aaasaan currently provide. BATCA’s vision for Balham and Tooting is a cohesive society where the contribution of diverse faiths, cultures and ethnicities to the common good is recognised and their diversity respected. This is essential if the good relations between different groups that characterise our area are to continue and strengthen. Making culturally sensitive provision for care needs, especially for the frail elderly and those experiencing dementia, is an essential element. BATCA is concerned that the tendering exercise for social care now under way fails to make such provision, and that experience and expertise such as Mushkil Aaasaan’s will be lost. Mushkil Aaasaan’s services are well regarded by CQC and deeply cherished by service users. As well as providing homecare services, Mushkil Aaasaan is a community hub. It makes a major contribution to social cohesion and good relations between different faith and cultural groups by opening its doors to everyone. Many community groups and voluntary bodies of all backgrounds have received hospitality and encouragement from Mushkil Aaasaan It provides badly needed community meeting space, often at no charge and always with a generous spirit. Many public sector bodies, including the CCG, have found Mushkil Aaasaan an ideal focus for community consultations. Loss of the home care services contract will make it difficult for Mushkil Aaasaan to continue this invaluable community support role. In its policy making generally, recognise and support the outstanding contribution Mushkil Aaasaan makes to community cohesion. Mushkil Aasaan could be under threat because the Council has withdrawn its contract to provide social care to vulnerable people in our local community. Of course the Council has a right to seek the best deal for constituents, but in this instance one wonders whether commercial expedience is trumping common sense in the Council’s offer of the contract to non-specialist providers, who may lack MA’s local experience, knowledge and cultural sensitivity. From TTT’s perspective we are incredibly grateful to Mushkil Aasaan director Naseem Aboobaker for her offer of free meeting space in the hall over the last 10 years, and provision of a space for Tooting Community Garden in the grounds of 5 North Drive for the last 5 years. Many reading this will have been to Foodival, Restarts, Gardening sessions or other meetings all of which have been faciliated by Naseem’s kindness and community spirit. Now Naseem requests that the Council reinstate Mushkil Aasaan’s contract and status as a Specialist Provider and TTT strongly supports this. My mother has been working for mushkil aasaan which is a local charity caring for people in their homes across Wandsworth. I have personally witnessed first hand the due care and attention my mother has worked looking after the elderly and less abled. My mother has been working for mushkil aasaan full time for 20 years and the need for providing a bespoke service to the elderly and less abled cannot be underestimated. With the rise of people entering old people’s homes mushkil Aasaan has ensured their clients are looked after in the comfort of their own homes alleviating the pressures their family members have in looking after them. During the summer of 2013 my mother unfortunately suffered a minor heart attack and we were overwhelmed by the support shown by mushkil Aasaan but more the clients who she looks after. They visited us to ensure my mother was ok and this showed me that the spirit created by mushkil Aasaan in the community is unparalleled and very few charity organisations have this impact in the local community. I would plead with the local authority to let this great work continue where individuals are able to receive an amazing bespoke service from trained staff from mushkil Aasaan and keep the spirit of the community alive. Below is a link which details how the demand for care homes are increasing. As the clients in Wandsworth are mainly from the Asian community the requirement for these individuals to not be shunned to old people’s homes and be able to receive a high level of service in the comfort of their homes from trained mushkil Aasaan staff is needed now more than ever. I thought it would be helpful to offer an insight in to the impact Mushkil Aasaan has made to someone – who wasn’t a client, careworker, employee or colleague – rather as someone who has grown up seeing the charity develop from the cusps of my bedroom.There are three things in life – something to look up to, something to look forward to and something to chase. The thing I chase is the example my mother has set for me. The same mother who has built Mushkil Aasaan and all its impacts to the potent community power it is today. I am fully aware that I will never reach the same example in the same form – I can never beat my hero – it gives me somebody to keep on chasing. An example has been set to aspire to.As a society, we focus so much on failure; we study it, we are obsessed by it, we can becomed isillusioned by it. Mushkil Aasaan’s change from a small agile set-up to the cornerstone ofthe Community has taught me to lean on faith more than I lean on my own self for what happens in the future. It has taught me to dissect successes and to build on optimism, but moreover that gratitude reciprocates.Becoming a man within a Charity which started in our home, I have learnt that we do our best when our destinations are beyond our measurement. When we do this, the race is never over– the growth continues to happen – all the time. The adventure never ends – it is the approach to the process that matters.Ultimately, I have seen and learnt that we live in a noisy world with all sorts of commitments and challenges coming at us – they make it hard to hear all of the frequencies and get peace of mind. Mushkil Aasaan has taught me to have the patience to internalise the truth and to then have the courage to act on it. To make it an active part of who I am, who we are and live it. 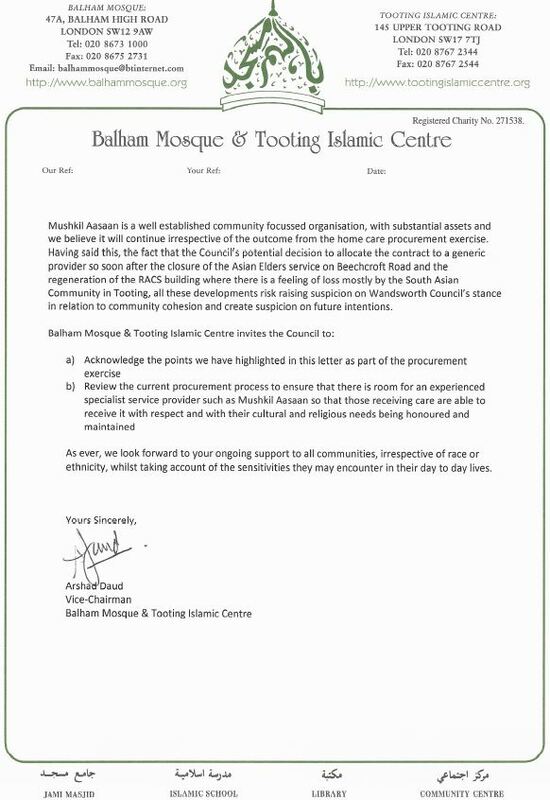 We are writing to express the concern of the Tooting Bec and Broadway Neighbourhood Forum (TootingBBNF) at the potential loss of homecare services meeting Asian cultural needs that are currently provided by Mushkil Aasaan. In order to better understand and represent the people of Tooting we have undertaken a major consultation including 18 face to face events and an online questionnaire – attracting nearly 1,000 responses. Initial findings from this consultation (which will be published on 12th December) show very clearly that two of the key factors people see as central to their affection for the area are its diversity and its strong sense of community. It is vital for the success of the neighbourhood, and we believe for the wider borough, that these characteristics are recognised and protected. Having culturally sensitive provision for care needs, especially for the vulnerable, elderly and those experiencing dementia, is an essential part of this. We were concerned to hear that the recent tendering exercise for social care now underway fails to make such provision and that experience and expertise such as Mushkil Aasaan’s may be lost. Another key finding from our consultation is a desire within the community for strong local amenities (with amenities supporting health and wellbeing often referenced). As well as providing homecare services, Mushkil Aasaan provides a community hub which opens its doors to everyone. We are amongst many community groups and voluntary bodies of all backgrounds who have received hospitality and encouragement from Mushkil Aaasaan. The TootingBBNF have held meetings, consultations and even our launch event in the building and always without charge. As a volunteer led community organisation which was set up and still operates without funding, the opportunity to use this space without charge has had immeasurable value. The loss of the home care services contract puts at risk the ability of Mushkil Aasaaan to offer such community support. • In its policy making generally, recognise and support the outstanding contribution Mushkil Aasaan makes to community cohesion. I am writing to you as a fellow councillor in South London. I am sure you are aware of the arguments for maintaining the the work that Mushkil Aasaan does. I express my concern about the decision of Wandsworth Council to no longer contract for specialist, targeted Homecare for minority ethnic communities in the borough. I believe it has been put at risk of closure, which will not only affect its beneficiaries but also around 100 local people employed by Mushkil Aasaan whose livelihoods are now at risk. I am aware that the Council has been publicising details of Mushkil Aasaan’s finances. I believe it should be understood that Mushkil Aasaan is not a profit-making business. It is a Charity established and run for the good of the community. The cash holdings it has are the result of careful management and are earmarked for an innovative intergenerational housing project providing much-needed homes, with 25 units of supported housing for older people and provision for families and children. This is one of many projects and initiatives now at risk. I understand there is a vote this week at the Council that may ratify the new contract arrangements. I ask you consider the implications carefully, and take some time to explore the unintended impacts of the new contract for some of our most vulnerable and isolated fellow citizens and reinstate a Specialist contract that Mushkil Aasaan would surely have a good chance of winning given its long and successful history serving Tooting and Wandsworth. Many of you may have heard, that Wandsworth Council have not renewed the Home-care contract for Mushkil Aasaan. This is after 25 years of providing a specialist service to the local community. It is an understatement to say that they and their community have been in shock at this news. You will all know I am sure that Mushkil Aasaan has been a core and supportive member of our Network since our beginnings, and have hosted many of our meetings and events at their building on Upper Tooting Road. This centre has very much become a de-facto home for our work in Tooting. Over the past few weeks a campaign group has formed to Stand with Mushkil Aasaan and protest the Councils decision. The group includes a number of other organistaions that have benefited from the openness of the Mushily Aasaan Centre, including Transition Town Tooting, BATCA, and Tooting Neighbourhood Forum. Service Users and Carers are also part of the group, as they will be the ones most impacted by the withdrawal of Mushkill Aasaan services. And a Protest at the Full Council Meeting on Wednesday 5th December at 6.30pm. We hope that you can support these actions, and encourage as many people as you know to do so. In the face of the use and misuse of power and resources, our strength remains in our unity and collective ability to respond to attacks on our communities. We are also compiling a register of those who support Mushkill Aasaan. If you are able to, we would welcome you providing a letter of support ( and something which we may be able to quote…a sentence or a few lines) which we may be able to include in our petitions and campaign literature . Please attend the meeting and protest, share the leaflet, sign the petition and support in anyway that you can. For 25 years, Mushkil Aasaan has provided essential home care to the people of Wandsworth – and especially to disabled people and BAME communities. Through its years of experience, it has developed culturally sensitive care. Retaining this service is vital, else Wandsworth Council risks further marginalising already marginalised communities. I write both as a Wandsworth resident and as the director of a charity here. I am dismayed to hear there is a possibility that the work of Mushkil Aasaan is under threat. They provide a specialist service that isn’t available anywhere else in the borough- it is truly unique. Not only that, they are a great friend to many local organisations, offering their space at very low cost to ensure that a wider range of people are supported than simply via their own work. They are generous, supportive and respectful of others, something that we should be encouraging across the borough in these cash-strapped times. We would lose a valuable asset if they were no longer able to run. I am asking you to add your support to their campaign.